In this topic, I would like to cover the base instance configuration of Db2 v11.1 to enable SSL connections from clients. In most situations, databases are accessed over a restricted network, but in some cases, it is necessary to allow access from an untrusted location. One part of this task is authentication (which can be done also via certificates) and another part is the encrypted connection that protects the communication between server and client, making it unreadable for the attacker. This post will cover configuration of Linux IBM Db2 v11.1 instance (other platforms are similar). It will allow you to connect to the database using any type of client which supports SSL connection. The configuration of the client will be covered in the further post. Make sure the connection concentrator is not enabled. If the parameter max_connections is greater than max_coordagents, the connection concentrator is activated. Update database manager to fix this requirement. GSkit is automatically installed when IBM Db2 is installed. SSL communication will always be in FIPS mode. SSL communication between the HADR databases is not covered in this post. Run all commands as instance owner. 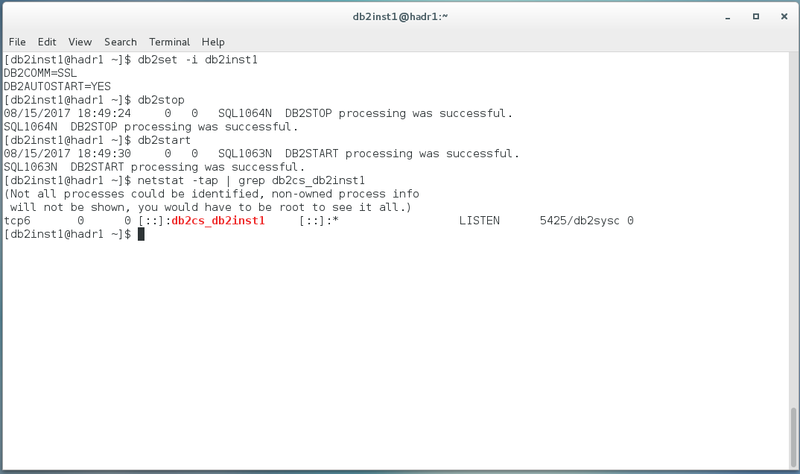 Command mkdir and cd will create the directory and change the location to the directory. The next step is to create a certificate for the key database. In this example, I will use a self-signed certificate. Creating a certificate signed by certificate authorities will be covered in another post. Here, I will create a self-signed certificate with a label mylabel. -dn – The X.500 distinguished name that will identify the certificate. Only a CN (common name) value is required. Other information can be added to the DN (distinguish name), such as O for an organization, C for a country and so on. -sigalg – signature algorithm used for the certificate. Algorithms for PKCS #12 are used. Now it is necessary to extract the certificate file that will be distributed to clients to enable them to establish the SSL connection (client version 10.5 FP 5 and higher). The extracted certificate will be stored in the file server.arm. -fips – enable or disable Federal Information Processing Standards mode (true or false). True by default. Now it is possible to configure the Db2 instance. The first command sets up the option SSL_SVR_KEYDB. If this parameter is null, SSL support is not enabled, so the path to the key store file is required. The following command sets up the SSL_SVR_STASH option (for a stash file). The SSL_SVR_STASH option needs to be set to enable SSL communication. Both commands will return the warning SQL1362W. It can be ignored for now. It is also necessary to set the SSL_SVR_LABEL and fill it with the value defined as a label when the certificate was created. The service name is db2cs_db2inst1, port 50001, protocol TCP. This parameter is also required to enable SSL connections. The last step before a restart of the instance is to set the environment variable for the instance. The database manager can support multiple protocols at the same time, but the following command will enable only SSL connections. 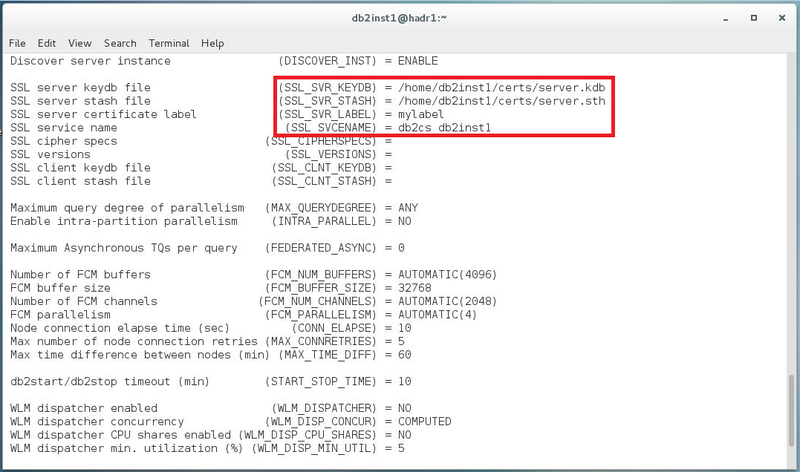 This command will allow SSL connections for instance db2inst1. The last step is to restart the instance. If you see no error during the start, the configuration was successful. You can do a quick check with netstat and see if the port for the service is listening. To establish the SSL connection from the client it is necessary to configure the client. These steps will be described in a future post.